Trois ensembles de curseurs ouvrent sur une vaste terrasse. Vues incroyables. »week-end parfait »,« idyllique »,« romantique »,« serein »,« cadre magnifique »,« 2e voyage mieux que le premier. Ce sont tous les commentaires prises directement à partir du livre d'or. Ce chalet est situé sur une zone très calme et privé de Skaneateles encore près de la ville. Excellente truite et la pêche au bar du bord du lac. Profitez d'un verre de vin Finger Lakes sur le pont en bord de mer ou sur le pont enveloppant trois côtés de la maison. Accès à la plage facile schiste pour les enfants. Profitez de baignade et la navigation sur l'un des lacs les plus propres du monde. 2 chambres doubles, mezzanine w / 2 lits jumeaux et un lit queen dormir. Nouvelle douche dans le bain maître. Si vous avez eu assez de temps de qualité avec les enfants, les envoyer au sous-sol Walkout avec TV et ping pong .Les deux fixes et des quais flottants. 2 kayaks et canoë. Regardez les collines sur le lac allument que le soleil se couche. Très bien situé sur le lac. 4 milles à Village, à 1 mile Winery ou Marina. Quai fixe et plateforme de bain flottante, 2 kayaks, 1 canot, ping-pong au sous-sol, lave-vaisselle neuf, amarrage en eau profonde pour bateau. Foyer au bord de l'eau, 150 pieds de front de mer privé. Great owner ! Home is 1 mile from marina and 4 miles to town . The property is very clean and well maintained/equipped. We didnt want to leave but cant wait to come back ! We were in town for a wedding and decided to stay here rather than in a hotel... and I'm so happy we did! 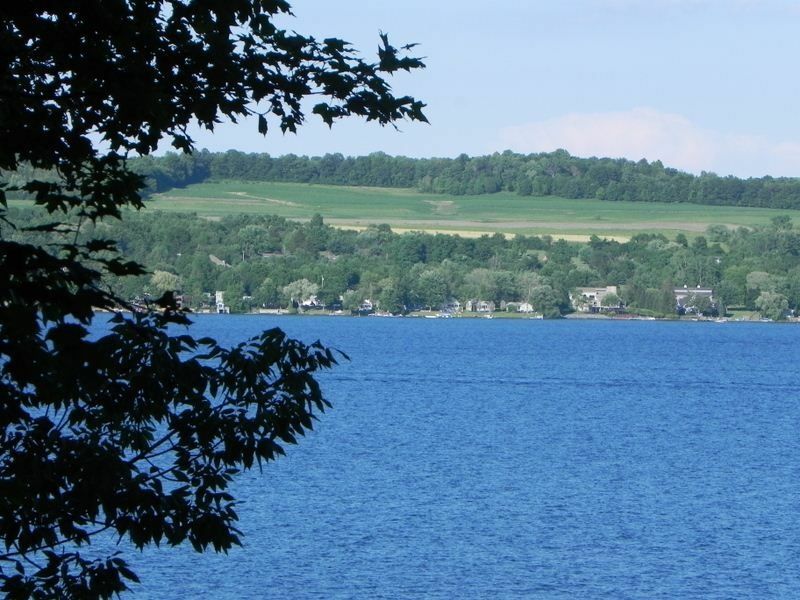 We had never been to the finger lakes region and Lake Skaneateles took our breath away -- so clean and so beautiful! In between all of the weekend wedding events, we were able to read a good book on the balcony, sit on the beach or the dock while enjoying a good beverage. The house was perfectly stocked with everything you need, private, very clean and decorated very tastefully. Our parents who are in their early 70's did just fine with the stairs. The driveway scared my mom a bit at first because you are definitely on a slope, but my husband and dad found it to be a good challenge! -- it's SO worth it for the gorgeous lakefront location! We are already talking about when we will return. We'd love to have more time to spend on the water, have a campfire, go hiking in the area (maybe finally beat my husband in ping ping) or just relax! Thank you . We find it to be a unique and very special location as well and one of the prettiest lakes in the Country. The house worked really well for our group. Our adult son slept in the lowest level - he thought it was cooler and there were two fans. The view of the water is great, and our guests who live in the area thought it was great and really loved the deck. The driveway down is a bit challenging - steep with two hairpin turns, but we are from the mountains of Colorado and could deal with it well. The kayaks, canoe, raft and chairs by the beach were a real plus. The town of Skaneateles is also a great plane to explore. Grandma, aged 79, found it somewhat hard to get down to the beach which is quite a ways down from the house. Having to bring towels was inconvenient for us traveling from Denver, and we did buy more toilet paper and bar soap for the shower. Overall, it was a great place. Thank you for your kind words. We stopped providing towels a few years ago to speed up the cleaning and allowing guests to check in earlier when traveling by plane. We will however provide towels upon request when flying to Skaneateles if needed. We feel our location is one of the most private and convenient locations on the lake. We had a fabulous week relaxing on this pristine lake! The house had every needed detail and felt like you were at the place you would have if you could! We enjoyed kayaking and reading by the lake, as well as the deck that overlooked the lake (we especially enjoyed the rocking chair out there!). The driveway is steep but was no problem for our experienced drivers! We loved feeling like we were away from it all, but being so close to Skaneateles to check out the restaurants, and stopping at the vineyard across the road that was recommended to us. We enjoyed the lake most, but came with family that spent time going through the many museums and hiking areas around there. We didn't realize what a beautiful part of the country that is! Fantastic lake house, great for kids and relaxing. I've been visiting Skaneateles for many years and have stayed in most of the hotels and a number of houses. I must say that this was the best experience we have have had. We bought my 15 year old son, his 3 friends and my 18 year old daughter. The boys had an amazing time, hanging on the beach, fishing off the dock or playing ping pong in the basement. We also bought up our ski boat and moored it right off the dock. The house is setup nicely with the loft for the boys to sleep and separate bedrooms for the others. We would sit on the back deck and have coffee in the morning and watch the sun over the lake. The deck was so relaxing for everyone! The property was very clean and have everything that you needed. I had to contact the owner a few times to coordinate arrivals and he responded immediately. I would strongly recommend this house for anyone that wants a relaxing and fun vacation!